Hà Nội University of Industrial Fine Arts’s main hall is a painting workshop. Hà Nội University of Industrial Fine Arts wears a busier look than usual. Every nook and cranny of the university is filled with artists from across the world. 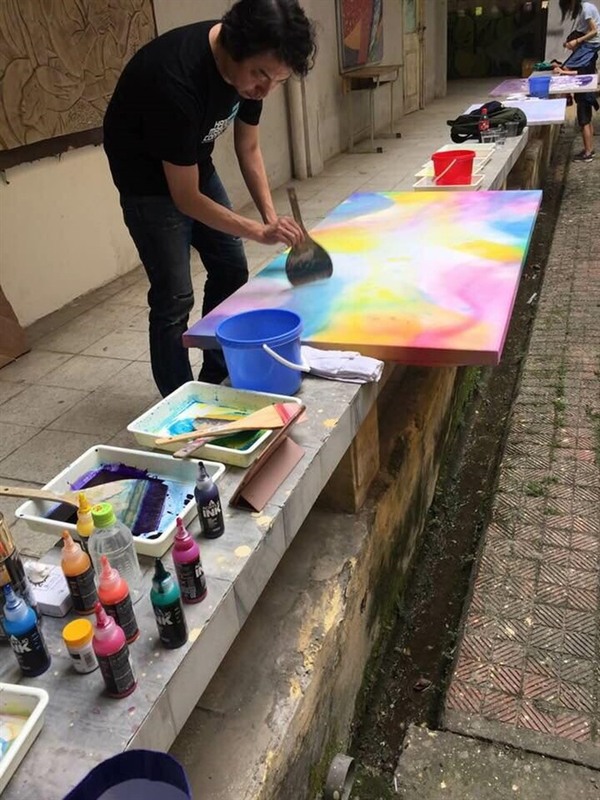 They have turned the campus into a huge workshop to create artworks using different media, such as painting, printing art, sculpture and ceramics. 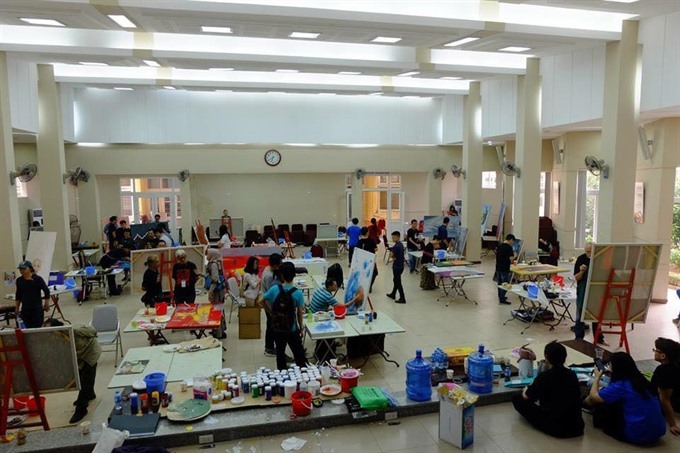 The three-day workshop is part of Hà Nội March Connecting, held by the university and Asia Art Link from March 26 to April 4. The event brings together 58 foreign artists from 18 countries and territories along with 62 Vietnamese artists. Even though it’s been only two years since the first edition in 2016, the event is the only Vietnamese art festival that has attracted such a large number of local and international artists. Artist Ipong Purnma Sidhi from Jakarta is one of the two Indonesian artists attending the event. He has chosen a quiet corner outdoors to make a painting. On Monday morning, the first day of the workshop, Sidhi completed some 20 per cent of the painting. He uses acrylic to paint on a canvas measuring 145cm by 100cm using the expressionism style. Unlike the artist’s gentle nature, his painting, titled Strong Man, looks energetic. Sidhi is known as painter, printmaker artist, illustrator, curator and book designer in Jarkata. He studied fine arts at the Indonesian Institute of the Arts in Yogyakarta and printmaking at the Royal University of Fine Arts in Stockholm in 1996. However, he gave up painting for a long time on being diagnosed with lung and heart diseases. He resumed painting again in 2007. “I want to change my life and prove that I still live and work despite undergoing medical treatment at the hospital 11 times,” says the 63-year-old artist. His enthusiastic outlook towards his work does not make anyone he talks to feel sorry for him. Sidhi had earlier visited Hà Nội in 2016 for a group exhibition at the Việt Nam Fine Arts Museum. 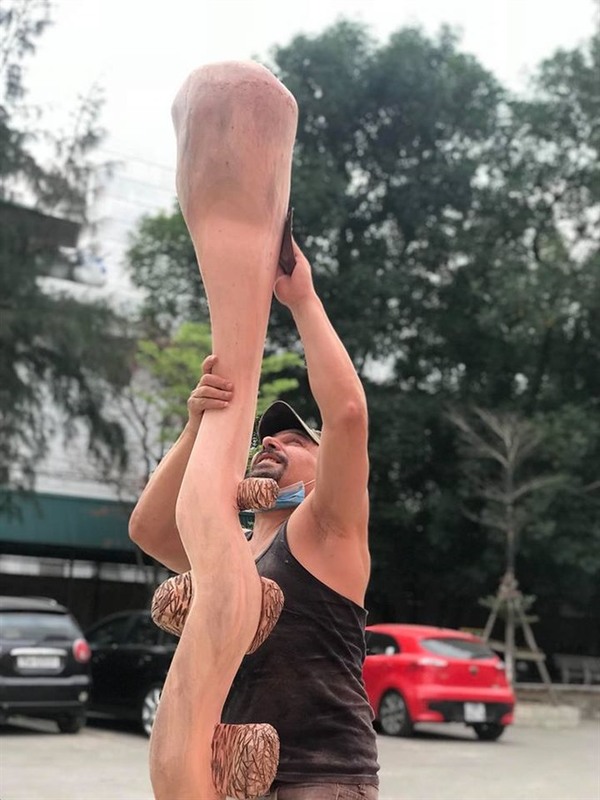 He is participating in Hà Nội March Connecting for the first time. The event has helped him meet colleagues and friends from all over the world, including German artist Katrin Hamann. Hamann is the only artist from Germany attending the event for the first time. Ignoring passers-by and wearing headphones, she seems excited about the place where she has chosen to work during the worskhop. It is located next to the side door of the university’s main hall. Hamann is separated from the numerous artists drawing inside the main hall by a small wall. She says it makes her feel comfortable to paint outside. “I prefer to paint outside any time as it’s better,” she says as she paints. Her artwork includes one large and two smaller paintings that are eye-catching with bold and bright colours. The painting looks a bit like pop art as it is very colourful. Hamann uses blue and pink shades to paint a woman’s face, something that always impresses her. Her painting, which uses expressionism and meditation styles, is acrylic on canvas. According to her, once the paint dries up, the colour of the woman’s face will change to red, and she will use gold leaves on the face. “The painting reflects the love for life. It will shine under the sun as well as in the dark because of the gold leaf. It is like a structure of love,” says Hamann. She is enjoying the pleasant weather in Hà Nội as it is much colder in her home town in Hannover, where she works as a freelance artist. Hamann is among seven other artists who are staying at the university instead of a hotel like many others to be closer to their artworks. They consider it a waste of time to be moving from hotel to the university every day to attend the workshop. Hà Nội March Connecting has been held consecutively since 2016. The event is organised by Asia Art Link founded by Vietnamese artist Trịnh Tuân. This year, the number of participating artists and countries has seen a dramatic increase compared to the previous years. While five countries participated in the first edition, nine countries took part last year. “Hà Nội March Connecting is well recognised,” says Tuân, a member of the organising board. “Besides the increasing number of participating artists and countries, this year’s event will select some artworks made at the workshop to be displayed at the Ministry of Culture, Sports and Tourism’s Exhibition House for the public,” he says. Tuân is a master of the traditional Vietnamese lacquer style of painting using which he creates modern works. 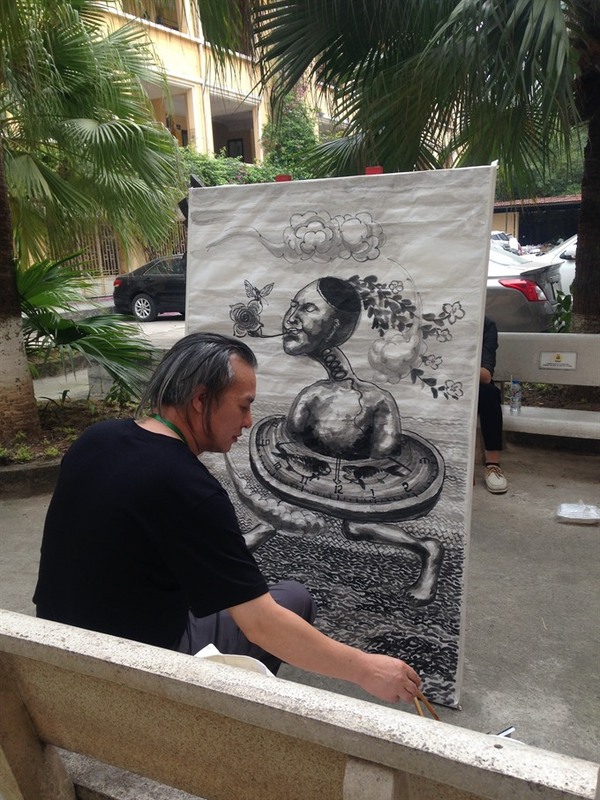 He is currently a lecturer at the Hà Nội University of Industrial Fine Arts. He plays an active role in popularising Vietnamese fine arts to the world. He and Malaysian artist Ng Bee co-established Asia Art Link in 2007 with the aim of connecting artists in the region. “Hà Nội March Connecting is my art project that took me 15 years to implement,”Tuân says. “The event has been held successfully since 2016, thanks to support from the university’s senior leadership team. 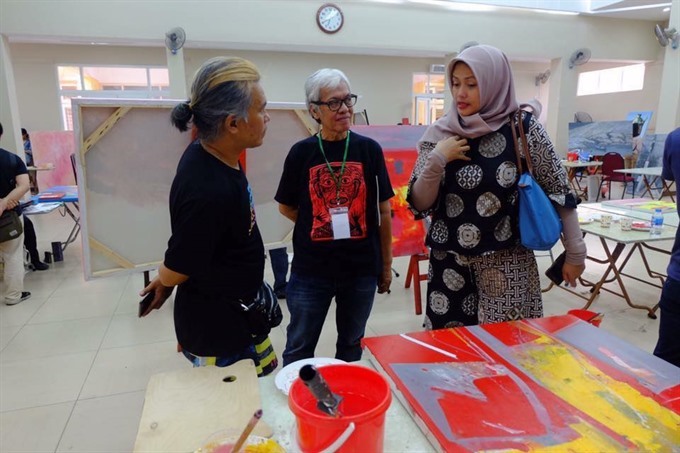 They have recognised how meaningful the event is to students and lecturers alike and how it provides a meeting and exchange opportunity with international artists. It is otherwise not easy to invite established international artists to come together. “The event attracts students from not only the host university but also from other art colleges in the capital. It helps them learn more about their future jobs,” Tuân says. 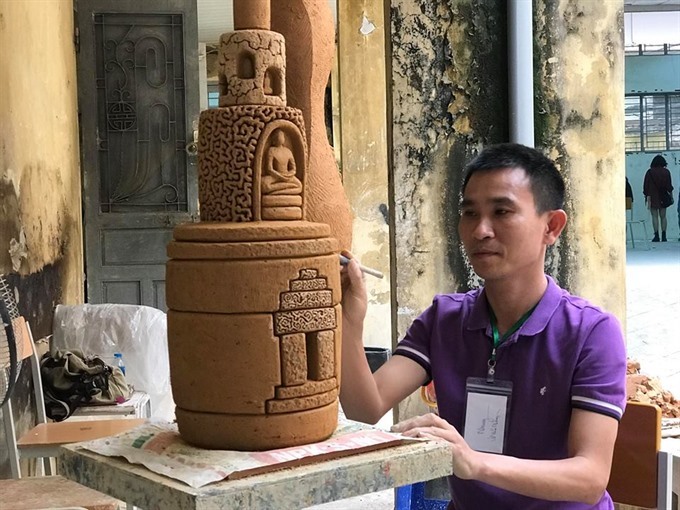 The third edition of Hà Nội March Connecting also features Vietnamese artists from the Central Highlands province of Đắc Lắc, central city of Huế and HCM City for the first time. The event’s organising board will select numerous artworks for display at Exhibition House, 29 Hàng Bai Street, from March 31 to April 4. Italian artist Giuseppe Strano Spitu is completing his sculpture. Vietnamese established artist Vũ Hữu Nhung is working at the workshop. He is teaching sculpture at the university’s Faculty of Interior and Exterior Design. Chinese artist Wei Shen nearly finishes his painting on the workshop’s last day. 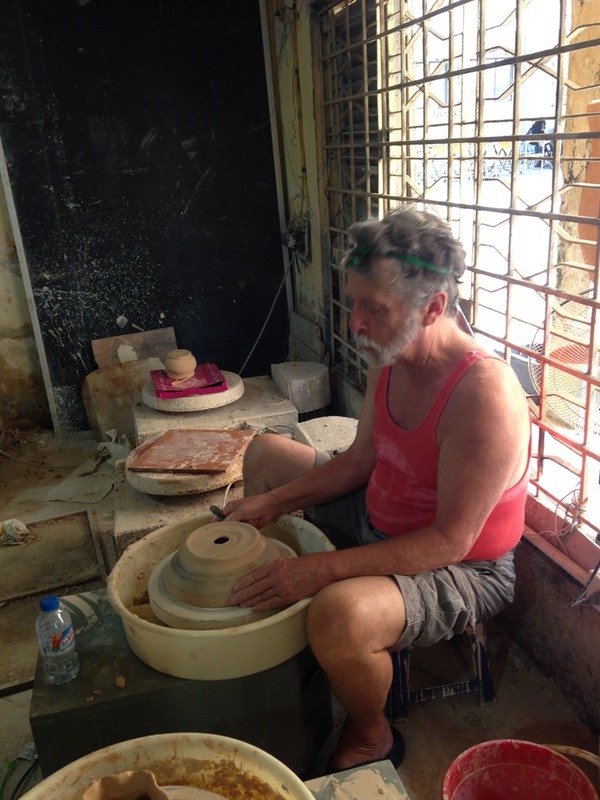 Daniel Potter from the US is working at Ceramics and Printing Art Workshop. Japanese artist Kei Yasaka has five completed painting after the workshop. Photos Nguyễn Bình and coutersy of Ha Noi March Connecting.